This post is sponsored by Tyson Foods, Inc and Southern Living®. All opinions are my own. With the Big Game just a few days away, it’s time to start planning a festive get-together with friends or a cozy evening in front of the television with your family. No matter how you choose to celebrate, easy appetizers are the foundation of any great Tabletop Tailgate. These 10-minute Slow Cooker Bourbon Barbecue Bites are simmered in a zesty, sweet glaze for a crowd-pleasing dish with a bit of Southern charm! Any of my regular readers know that my great Aunt Bee is the ultimate Southern hostess. With over 90 years of experience (!!! 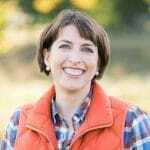 ), she has planned and executed a staggering number of parties for friends and family, and she is full of practical tips. Since she no longer spends a lot of time in the kitchen, I have been blessed to receive many of her most popular, cherished recipe cards. 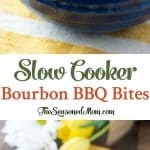 Simple, quick, and delicious dishes have always been her specialty, and these Bourbon Barbecue Bites are no exception. 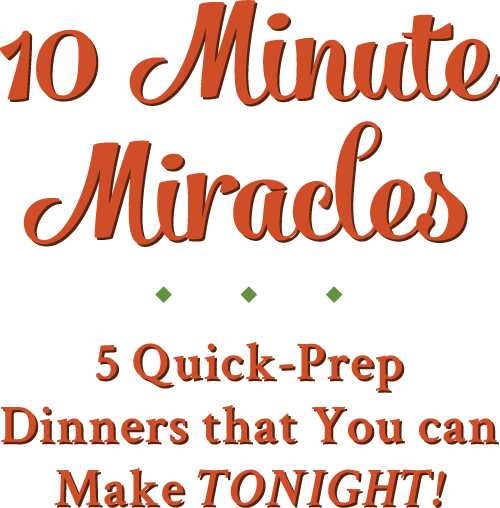 When Aunt Bee sent me this recipe late last year, I tucked it aside on my desk knowing that these easy appetizers would be the perfect choice for upcoming casual Game Day parties. In the true spirit of Southern hospitality, I took inspiration from the latest copy of Southern Living® magazine (one of my personal favorites! ), which I picked up at Walmart while I was shopping for the rest of my ingredients (you can find the publication at the check out or in the magazine aisle). A little bit of Kentucky Bourbon gives the bites a rich, flavorful kick that automatically puts your guests in “party mode” and sets the stage for your new Game Day traditions. 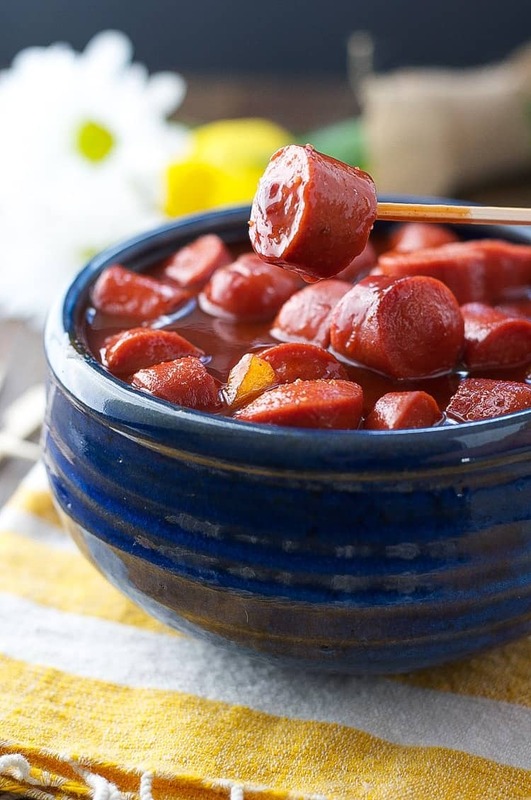 The only other ingredients needed to prepare these easy appetizers are chopped Ball Park® Beef Franks (find them in the refrigerated aisle), barbecue sauce, diced onion and brown sugar. They’re the perfect crowd-pleasing “snack hack” for Game Day! With a 10-minute spin through Walmart, I pulled together a simple #TabletopTailgate (complete with fresh flowers), for a festive Southern fete that would make Aunt Bee proud. 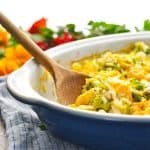 As I often do, I tweaked Aunt Bee’s original recipe slightly so that I could prepare the bites in my slow cooker. After all, when it comes to hosting a party or enjoying the Big Game, I don’t want to be slaving over a hot stove in my kitchen while my friends and family are partying in another room. Instead, I place the ingredients in the pot a couple of hours in advance and just let them simmer on the counter while my guests help themselves. 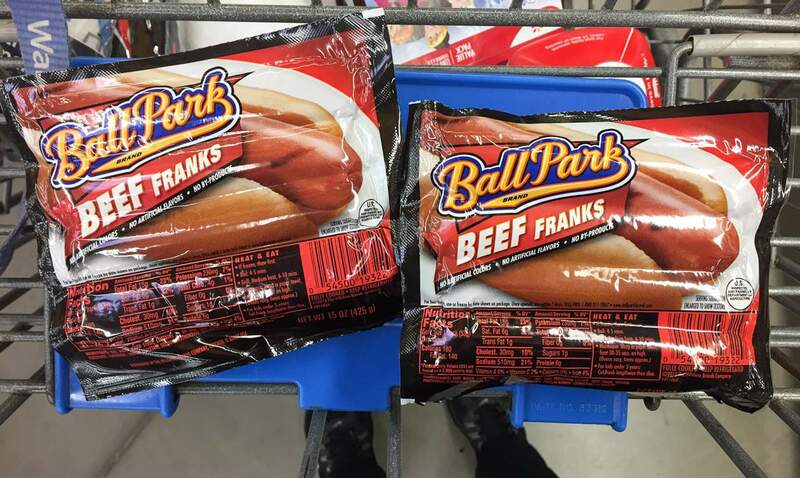 The end result is a thick, sweet and flavorful glaze that coats each of the tender, juicy Ball Park franks. The salty-sweet combination is to-die-for! As you plan your upcoming festivities this season, I hope that you’ll take some advice from Aunt Bee’s recipe file and prepare easy appetizers that allow you to enjoy your party, spend time with your friends, and focus on the fun! 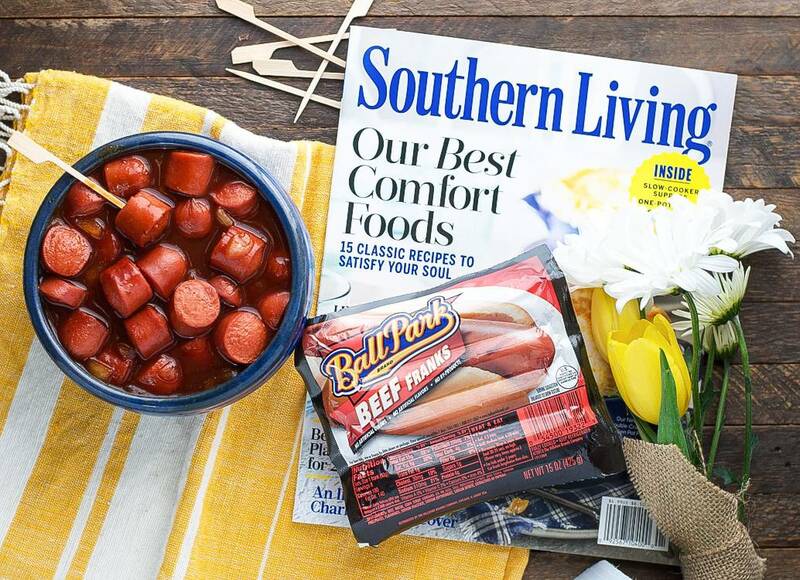 Southern Living® and Ball Park both offer great Game Day inspiration, and will soon become a staple at your events as well! Slice franks into bite-sized pieces (I cut each hotdog into 6 round pieces). Heat oil in a large non-stick skillet over medium-high heat. Sautee sliced franks in the skillet just until brown (about 3 minutes). Meanwhile, place barbecue sauce, brown sugar, bourbon, onion, and water in a small slow cooker (I used a 2-quart slow cooker). ** Whisk until completely combined. 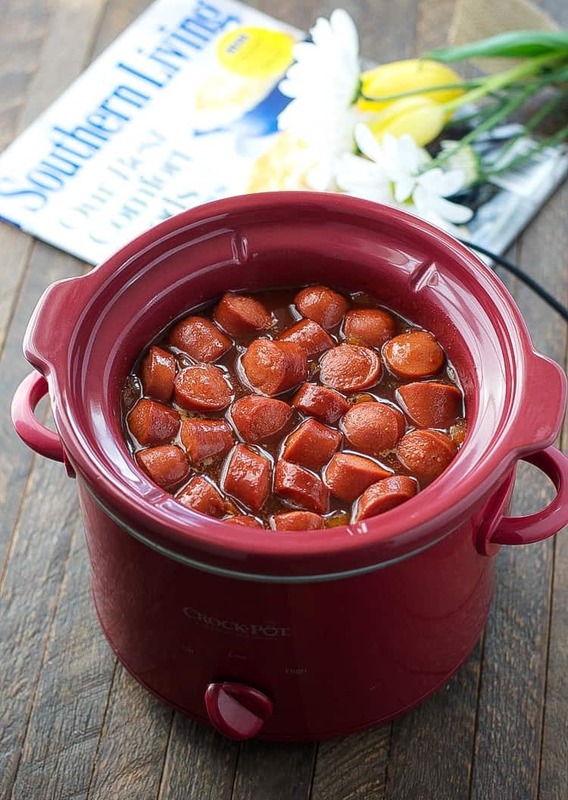 Transfer browned franks to the slow cooker, stir with the sauce, and cook on LOW for 2-3 hours. *For a no-prep shortcut, I like to use frozen diced onion. **If you don’t want to use a slow cooker, you can simmer the sauce in a saucepan (covered) on low heat for about 25-30 minutes. 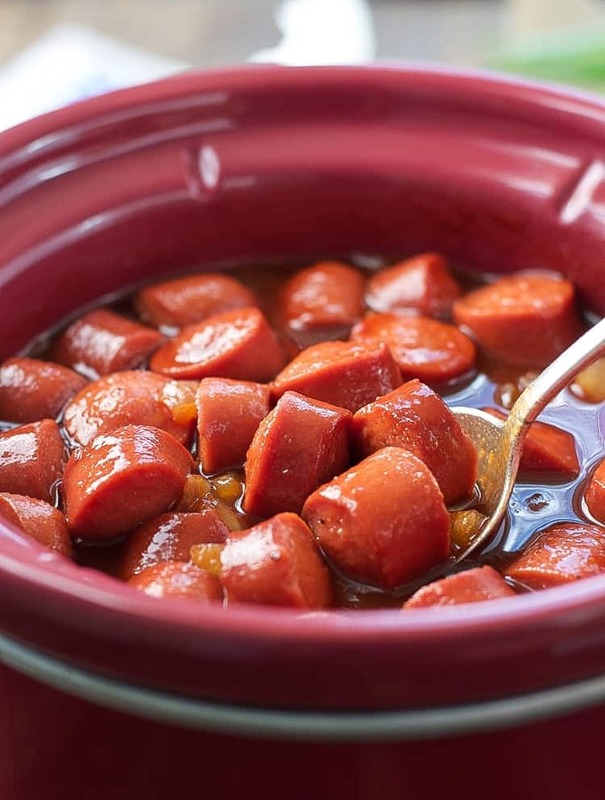 Add the browned hot dog bites to the sauce, stir, and heat through. Serve immediately. 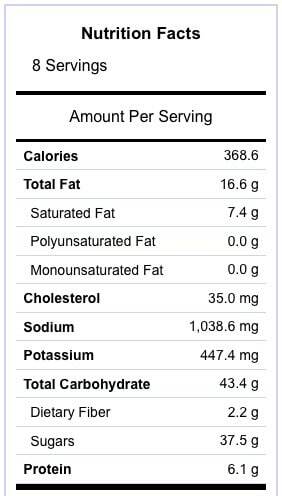 Note: Nutrition information includes 6 “bites” per serving, as well as all of the sauce. 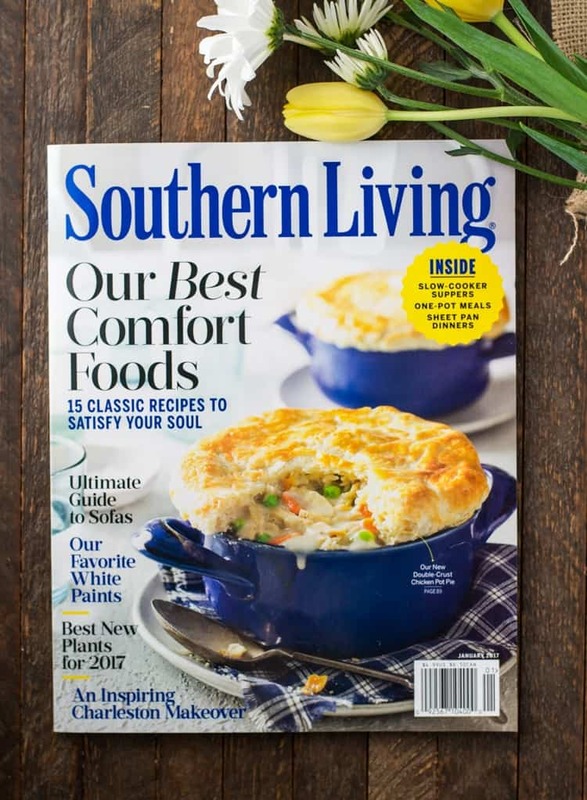 You can also score big with rebates on Tyson Foods and Southern Living® magazine, as well as other great recipe-inspiring magazines, with the FREE iBotta® app. 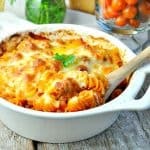 I love slow cooker appetizers like this! It’s the first thing that I reach for at parties. These bites look so good, Blair! I love the barbecue and bourbon mashup. My kind of dish and I have a feeling this would be gone in no time! This looks like a great idea for the big game! And I love anything I can fix in the slow cooker. I definitely be adding this to our celebration! Thanks, Jeanette! I agree — it’s perfect for the Big Game! My husband would LOVE if I made this for Sunday. Adding it to my list right now! 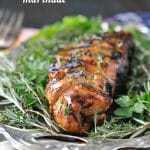 You just can’t go wrong with this recipe, it’s delicious! I knew a similar one, but as always, there are a couple of differences. I’ll try it your way! What can be substituted for the bourbon? Hi, Debbie! 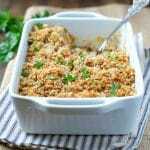 You can substitute with an additional 3/4 cup of barbecue sauce, or you can keep it sweet with 3/4 cup apple juice/cider, or make it more savory with 3/4 cup chicken broth. Hope that helps! That’s great, Kimberly! I’m so glad that you enjoy them! 🙂 Thanks for stopping by and for letting me know! 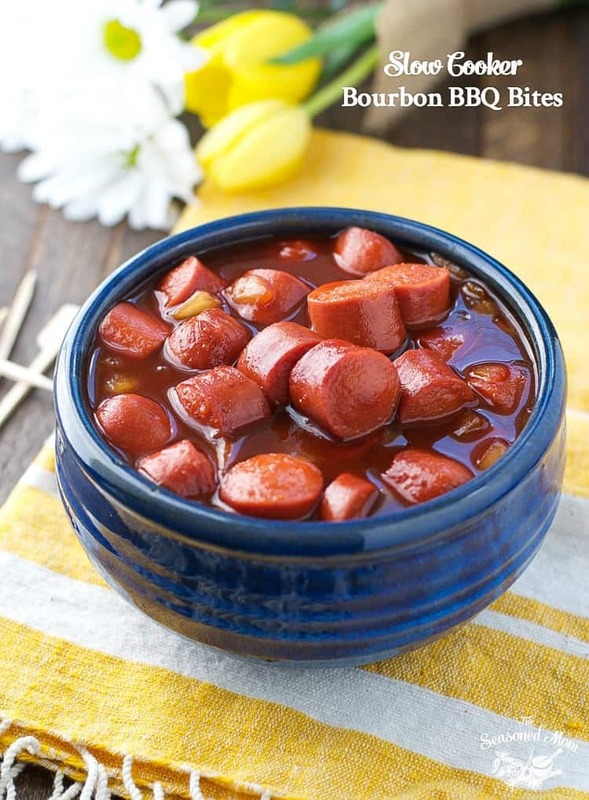 For this recipe can I use other brand of hot dog like Hebrew National Beef digs?